As we’re quickly approaching Thursday and all it’s turkey-deliciousness, I wanted to take a quick moment to share a couple things that I’m really thankful for. 1. A family whose love I feel so undeserving of. Really. They’re absolutely amazing! How did I ever get so lucky to be part of this crazy mob? And the kids! Their cuteness factor is absolutely off the charts! 2. I’ve never had to worry about where I’m going to sleep that night. After listening to some folks at church on Sunday share their stories of a recent mission trip an Indian reservation near Globe, AZ, I have a renewed spirit of gratitude for the simple things that I so often take for granted–like a safe, warm place to stay every night. 3. My job. While it may be trying and I may sometimes feel like I’m doomed to fail, I’m so grateful for not just steady income (which is pretty incredible as is), but getting to work in an industry that’s always been my dream. I believe that the books that I get to work on are making a difference not only in this life but also in the next. 4. My other job. Somehow God has seen fit to fulfill one of my biggest dreams and given me the opportunity to write books. If God never gives me one more thing, I’ve already been given so much more than I deserve. And I’m going to choose an attitude of gratitude not just this time of year. What are you choosing to be grateful for this year? 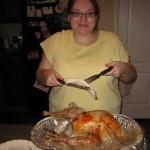 So I thought I’d share some of my Thanksgiving memories with you. Because of Stephanie’s work schedule, we (Amy, Katie, Steph, and I) decided to have our big dinner and celebration on Wednesday night, which was actually wonderful! It was great not to have wake up early on Thursday to get the turkey in the oven. I had everything but the turkey done, so when I got home from work, all I had to do was pop it in the oven. 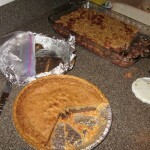 Then everyone brought their additions – potatoes, corn bake (yum! ), rolls, and more. 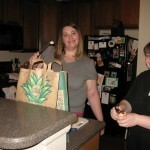 Stephanie and Amy making garlic mashed potatoes. So good! 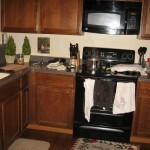 the wildness of a kitchen in use. 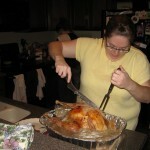 Me carving the turkey. It’s a miracle the thing was edible–and even pretty good! More bonding with the turkey. Watch out for that juice!!! Cranberry compote and chocolate chip cookie dough pie for dessert. Yum!!!! 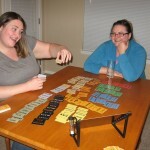 Katie and Stephanie playing a game after dinner. I failed to take pics of Hilarium, the game that had some of us almost peeing our pants with laughter. Fortunately these pictures don’t show the moment that I realized that while carving the bird I’d punctured the bottom of the baking pan and turkey juice was leaking down the front of our dishwasher, and I was standing in my socks in the puddle. (Yuck!) Or when I realized that I’d left the paper bag of giblets inside the whole time it was baking. (double yuck!) I mean, I took out the plastic bag and the neck and wrestled out the plastic thingy-ma-bob that holds the legs. Why didn’t anyone tell me that there was another thing to look for? And then there was that instant that I remembered I hadn’t put any salt and pepper on it. And that other time when I realized that I’m absolute rubbish (only a British accent will do for this sentiment) at making turkeys! Next year, I will gladly give up the duty to someone … anyone else! What was your biggest Thanksgiving success … or failure? Happy Thanksgiving! I hope that you’re able to spend some time with your family and share some things you’re thankful for. What’s on your list this year? As for me, I’m thankful for my family–the whole clan of Johnsons and Whitsons, especially the little ones, who make me laugh. And for my friends in Colorado Springs, who have become my family away from home. For my job and my agent and my publisher and my editor. Mostly I’m just thankful that God’s hand has been on my life, and He is faithful to continue working on me. I’m also thankful that today in Denver at Invesco Field, the Broncos take on the Giants. Go Giants!